Junior Kaiden Murphy carves soap in the Mindful Soap Carving Club last Friday at Hayes High School. Clubs resumed for the third year at Hayes. The clubs will meet every other Friday for the remainder of the school year, according to Assistant Principal Rex Reeder. Students in the Conspiracy Club begin to do research about their chosen conspiracies and make plans to present them to the rest of the club. Clubs are back at Hayes High School and they are more popular than ever. The clubs were implemented three years ago by Assistant Principal Rex Reeder along with the House system at Hayes to give students something to look forward to and to give them avenues to meet new people outside of their usual social circles. 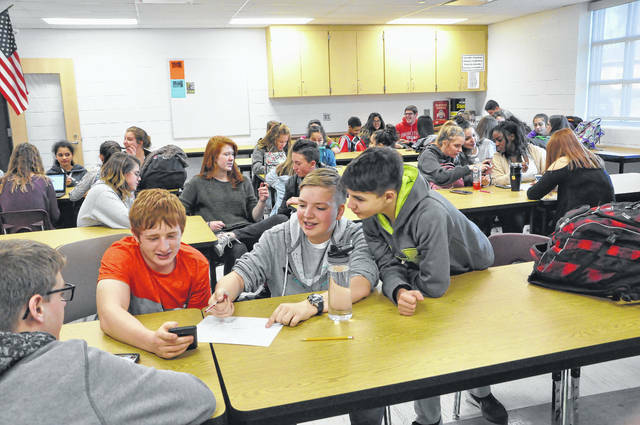 On Friday, clubs met for the first time this school year and will continue to meet every other Friday during a period that would normally be used for study hall. Reeder said when the clubs were started three years ago, they were broad topics, like movie club or art club, but over time they’ve grown to be more specific. Reeder said there are now very niche clubs like Political Science Club, Coffee Shop Music Club and four different film clubs — Film and TV, American Film, Spanish Film, and Sports Movie club. One popular new club is Mindful Soap Carving, which is taught by art teacher Cynthia Vaught. Vaught said the club is simply about students blocking out distractions and just focusing on carving something out of a bar of soap. According to Vaught, she had had students doing soap carving in her classes before the club was established and when she was coming up with her club one of her students, Kaiden Murphy, suggested soap carving. Murphy said she frequently does soap carving at home to relax and said she hopes at least some of the 32 students in the class will pick up soap carving as a hobby. Another new and popular club is Conspiracy Club, which focuses on students researching various conspiracy theories. One of the conspiracy club advisors, Seth Frentsos, said he always talks about conspiracy theories in his world studies class and one of his students said he should host a club on it. “It’s been so much fun,” Frentsos said. Frentsos said the course is a great way to get students to do research and said students will form groups and make presentations about their research into various conspiracies. Reeder said the conspiracy club had so many students register to join that it had to be split between two different periods, with a total of 75 students.